WELCOME TO THE NOVEMBER EDITION OF THE GO LOCAL. GO TEXAN. E-ZINE. standing tradition for many Texas families is going to pick out their very own Christmas tree. I encourage you to visit one of our many GO TEXAN Christmas tree farms and create a memory your family will never forget. From welcoming the town of Henderson into our family of GO TEXAN Certified Retirement Communities to how 4-H is encouraging young people to get involved in agriculture, this issue of Go Local. GO TEXAN. has it all. I hope you’ll enjoy this issue. Be sure to share it with your friends, and remember Texas Agriculture Matters! ...we’re talking about pecan pralines, pecan sandies, pecan sticky buns, sweet cinnamon roasted pecans, and of course, pecan pie. Pecans in Texas are a big deal — pecans are the official state nut, the pecan tree is the official state tree and the pecan pie is the official state pie. What are the best regions to attempt growing pecans in Texas? Pecans do well in drier climates where disease pressure is minimal, thus we see more production west of I-35 than in the eastern, more humid areas of Texas. However, intensive management with proper pecan variety selection does make it possible to produce pecans profitably in most areas of the state where good soil and adequate water is available. Soil is probably the number one thing to consider before planting pecans — the right type of soil with proper drainage. Pecans are native to river bottom land with rich, deep soil and will endure brief episodes of flooding. But they do not like what we call “wet feet” on a prolonged basis. a minimum of 50 acres or so might be necessary to justify the investment in equipment needed, such as a tractor, sprayer, mower, shaker and harvester. Also, who will be doing the labor: the owner, family members or employees? grows from that planted seed is considered a seedling and must be grafted or budded (two different techniques to create a hardy hybrid) to the desired variety. It takes years longer to get a tree into actual production, if the grower is growing from seed. Young tree care is critical. Water, weed control, pruning and zinc applications are the primary management emphases for young trees. Texas AgriLife Extension has online resources with guidelines for managing young trees and also publishes The Texas Pecan Handbook, which is a basic, comprehensive guide to growing pecans in Texas. It should be considered mandatory reading for new growers in particular. Additionally, AgriLife Extension offers a four-day pecan short course each January in College Station. Once I have trees, how do I harvest them? Pecans are shaken mechanically from the trees after the shucks are split and picked up mechanically. Nutritional Facts Did you know that pecans contain the highest antioxidant total of any tree nut? This and more health-related facts are featured in this new brochure, available for download here. You will also find sources to purchase fresh Texas pecans. Recipes Texas pecans make any dish taste better. Try out these tasty options featured in this new recipe brochure. 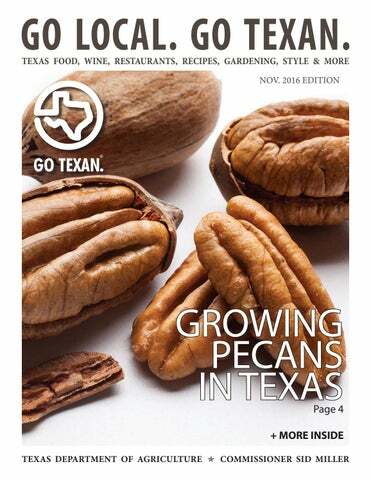 Download your free recipe brochure, which includes storage tips and a list of Texas pecan suppliers, at BuyTexasPecans.com. The Perfect Pairing for Success. Fresh flowers and wine are two Texas treasures that fit together to create a winning combination that makes the perfect holiday gift. Pair a gorgeous floral bouquet with a one-of-akind Texas wine to deliver the beauty and flavor of the Lone Star State in one unforgettable package. 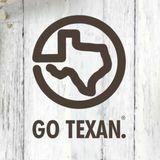 To find Texas flowers and wineries in your area, visit gotexan.org. theater, museums and historic homes are all found in this special place. Community events like Independence Day events, theatre performances and the Heritage Syrup Festival provide fun for the whole family. Henderson offers the conveniences and hassle-free living of small town America, yet provides many goods and services normally only found in larger communities. It’s also centrally located in the heart of East Texas, allowing for easy access to the larger communities of Tyler (30 miles), Longview (25 miles), Nacogdoches (30 miles) and Shreveport (65 miles). Stop by soon and see for yourself why Henderson is such a special place to visit. menu features Southern favorites like chicken and waffles, chicken-fried steak, ribs, burgers, fish tacos, salads and more. As much produce as possible is sourced directly from Texas growers at the famous Weatherford Farmers Market across the street. The vintage automobile gallery is free and open during restaurant hours Cars on display include: a 1930 Buick, 1940 LaSalle, 1948 Studebaker sheriff ’s patrol car, 1948 and ’64 Lincolns that belonged to President Lyndon B. Johnson and an East German-made 1975 Trabant. Learn more by clicking here. noot Designs contact designer, Anithia Oliver, said that certain criteria needed to be met before their company was able to grow from a crew of weekend hobbyists to a serious business venture specializing in personalized and engraved gifts. It wasn’t until 2015 that Knoot Designs became the business that it is today. “Shopping small and buying local is essential to growing our communities and local economies,” Oliver said. Knoot Designs became a GO TEXAN member because they wanted to show their support for agribusiness. “And of course GO TEXAN gives us a great opportunity to network in our state and beyond,” Oliver said. TEXAS 4-H: RIGHT ON THE DOT Dottie Cook, a Texas 4-H Extension Associate is honored to serve–as she calls it–the life-giving sector that is the agricultural industry. Her passion is livestock production and watching youth make a difference in agriculture and do more than just raise animals at a livestock show. opportunity to attend and work at all of the Texas major livestock shows. For more information on how you can get involved with Texas 4-H click here. Not every bo champions th nor can they source that is natural filter atmospheric chlorinated. Texas Crystal Water have endeavored to stand out from the competition with its packaging. extensive charitable, civic and church involvement. his delicious dessert recipe combines the sweet taste of bread pudding and chocolate with the official state nut of Texas — the pecan. The best part is pecans are in season right now. Custard Ingredients: ¾ cup	Whole milk 1 - 1½ cups	Heavy whipping cream 1 tsp. Vanilla extract ¾ cup	Sugar 1	Egg 5	Egg yolks Bread Pudding Ingredients: 6 slices	Toasted white bread 1 serving	Custard ⅔ cup	Chocolate sauce ¾ cup	Caramelized pecans Chocolate Sauce Ingredients: 6 oz. High-quality bittersweet chocolate, chopped 3 tbsp. Water ¼ cup	Heavy cream 3 tbsp. Sugar Caramelized Pecans Ingredients: 1 cup	Texas pecans ½ cup	Sugar 1 - 1½ tbsp. Butter 2 tbsp. Water 1 pinch	Salt Custard Directions: 1. Combine milk, cream, vanilla and sugar in a small pot or sauté pan, and cook until sugar is dissolved. 2. Place egg and yolks into a bowl and whisk together.